VH are now ahead of us again on head to head record. 3 game shoot-out to end the season between you and VH? Would you say it is too early for promotion so, it wouldn't be terrible if you didn't get it? Also, how are L'Entente SSG doing? Yes, it's just down to us and VH who gets promoted and neither of us really seem to be good enough. We are decent against the poor teams, but our best team is nowhere near good enough to be promoted at the moment. Don't get me wrong, promotion will have a positive impact in terms of finances, but we are already almost £2M in the red. If we go up, we go up. If we don't go up, then we have another go next season, (or more likely have another go in a different league). Nope. Seems the game has never heard of them either. Can't find them. Just had a look at google and it says they are called Sannois SG and yes I have found them now. They were promoted as National champions in Season 1. They finished Season 2 in 15th place in Ligue 2. They have just finished Season 3 in 11th place in Ligue 2. Just a draw in our final game would have been enough to be promoted as the best non-reserve Team, but we blew it and Vendee Herbiers beat us via a better head to head record. There was an enormous difference between ourselves the 3 big Reserve teams at the to and then ourselves and VH, and then there was another sizeable gap to the best of the rest. End of Season 3 May 2021. 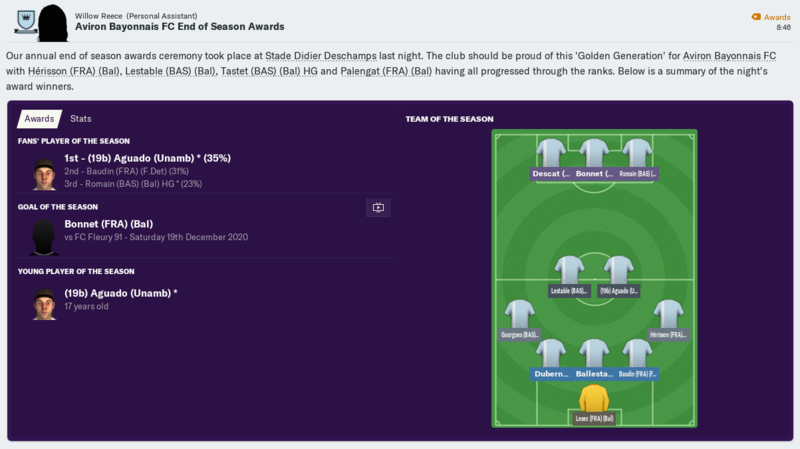 Although there is only 1 player in the team of the season who has come through the Academy since I took over, actually 5 of the players came through our Academy as follows. The money situation is not looking good. I'm just not sure that there is a solution at this level, or either the level above. It could mean that we have a pretty hefty debt by the time we get promoted to the big-time, (if we get promoted to the big time). Season 4 Preview. Jun 2021. We have 4 Reserve Teams in the league and I think that's the same as last season and that they are the same reserve Teams. Saint Etienne Reserves were Champions last season. Nimes Reserves were Runners Up. Actually........ no. We have lost Auxerre Reserves and they have been replaced by Toulouse Reserves who are a promoted team. Pau, Aubervilliers and Le Puy Foot have been relegated, but we actually have 6 promoted teams in the league this season. The pre-season odds suggest that we should be seriously worried about relegation. If we put the 3 good reserve Teams at the top. And then we add in the relegated Team. And then we add in the newly promoted Reserve Team. And then we add in ourselves. And then we add in the not so good reserve Team. And then we add in the other teams who remain from last season. Then we have the newly promoted teams. Bescanon Foot have been neither promoted nor relegated but have been moved sideways, as have Auxerre Reserves. 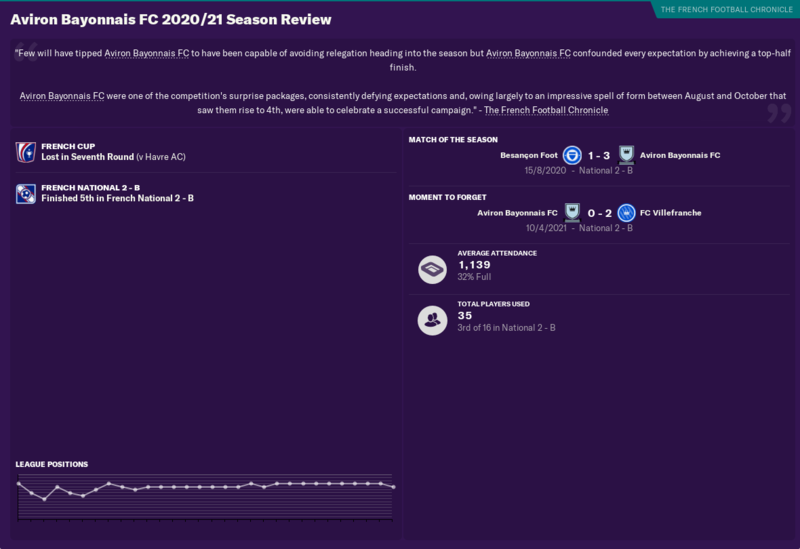 It was good to start with a win and then remain undefeated away to relegated Bergerac, but losing 3-0 at home to promoted Blois Foot was not what we needed. I know we only won one game this month, but a narrow defeat against 1 Reserve side and draws against another 2 is actually really encouraging. Add in that we spanked promoted RC Grasse and this was a really good month. Despite that, it's a little disappointing to find ourselves as low as 9th. We are 7 points behind Fleury 91 and Blois Foot 41. I am enjoying this. It makes a change to see you not in Iceland, though I obviously understand why you aren’t there. Thanks, but my exploits in Iceland started only relatively recently. Back in the day it was mainly lower league in England, then it was lower league in Ireland followed by San Marino in Italy, Partizan in Serbia and Red Imps in Gibraltar before my first soiree into Iceland. I really like Iceland, but it's good to try new Nations and I'm enjoying France so far. I've developed a bit of a style/strategy of completely rotating my starting XI in certain games. It has served me well in recent FM's and with relative success so far in FM19. Against table-topping Saint Etienne, (a game I thought that I had little chance of winning), I used this tactic again and it worked relatively well. Although we conceded 4 goals away from home, we also scored 2 of our own with a completely rotated squad. 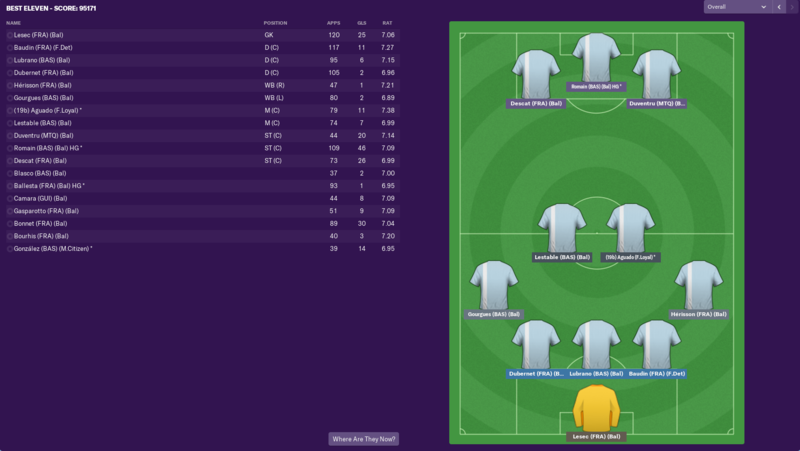 I would have been happy with a 4-2 away loss with my strongest starting XI. That I was able to rest them all so that they were fresh for the FC Sete 34 game only 4 days later, while still getting what I consider is a reasonable result, is something of a success. That we were able to only draw against FC Sete 34 less so. I tried the tactic again in the Cup, (against my better judgement), and while it resulted in us crashing out of the Cup, (we are not going to win it so who cares really?) we also secured 3 points against struggling Blagnac 3 days later,. How I should be using this tactic is resting players for league games and for Cup games where the opposition are stronger. I shouldn't be playing the kids against minnows because it just doesn't work. Almost, a perfect month but not quite, but we did at least manage a couple of GK goals. We're 7th in the league, 5 points behind Trelissac, but we have a game in hand over the 3 non-reserve sides above us. What a brilliant month. Not only did we win 2 away games, but we also managed to keep a clean sheet and draw against Toulouse Reserves to rocket us up the table to sit 2nd at the Winter break. With 11 games to play, we've put ourselves in a great position to go up as the best of the non-Reserve teams. These 2 Reserve Teams don't seem to be having a good time of it. While I am pleased with the 4 points this month, FC Fleury 91 did better and have leap-frogged us. (19b) Aguado (Unamb) * is being trailed by Ligue 2 sides Red Star FC (of Paris), and USL Dunkerque. Both have made tiny bids foe him, (which I have turned down), but he is now expressing an interest to leave and has asked to be placed on the transfer list. On 17th Jan he handed in a transfer request, (which I declined). On 28th Jan he handed in a transfer request, (which I declined). On 30th Jan he handed in a transfer request, (which I declined). On 1st Feb he handed in a transfer request, (which I declined). He's contracted until Jun 2025, (so 3.5 more years), and I plan on keeping him and making him see his contract out unless someone shows me the money. Well the takeover is over, so that's great, but we aren't really signing anyone anyway, (because our rep is still so low that none of the Spanish Basques will join us and the French basques are all pants). 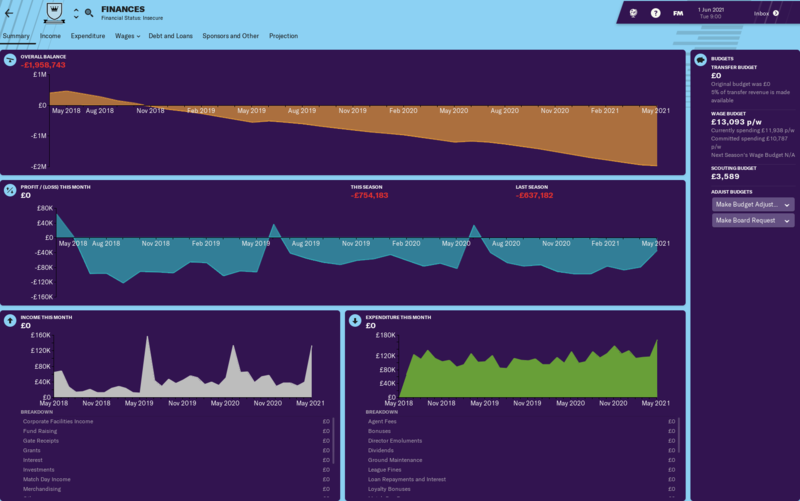 At the start of the season we were about £2M overdrawn, and I noticed that it had suddenly disappeared. The new board, despite not providing any investment, have at least cleared the 2nd debt via a 2nd loan. We are at least in credit again now. Youth Day 4. Mar 2022. As always, 1x 5.0 PA player is decent, but what makes the intake decent is that 4 other players have at least 3.5 PA.
What I don't like is the look of the injury susceptibility column. 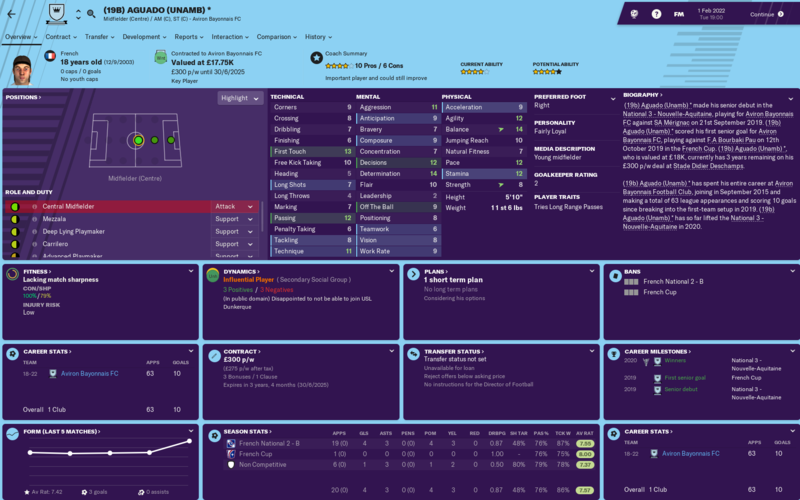 (22a) Fabio (Unamb) (2022) * is rated as above average, (22d) Orbegozo (Bal) is rated as high and (22e) Burger (L.Det) is rated above average. That's 3 of the top 5. "Kriss" (22a) Fabio (Unamb) (2022) *. I like the look of this lad and I like "Places Shots" PPM too. He's a lefty which is helpful and he starts off as a player who's strengths are very much physical. What I like about this lad is that he is very strong mentally at such an early age. He's already a natural BWM(d) and our best player plays in the other central role. 2019 intake as of Mar 2022. The big thing that jumps out here is that (19c) Marrero (Unamb) * was originally rated as just a 3.5 PA player but is now deemed to be a 5.0 PA player. He's an AMR so it's not exactly ground-breaking, but he's being retrained as a PF(d) so we can hopefully give him more game time. (19a) Núñez (F.Amb) (2019) *. (19a) Núñez (F.Amb) (2019) * might have progressed from 1.0 CA to 2.5 CA, but that actually equates to very little in terms of attribute improvement over a 3 year period. He's featured only sporadically and despite us scoring freely has been unable to find the net at senior level after 8(3) appearances. (19b) Aguado (F.Loyal) * started off as (19b) Aguado (Unamb) *. I'm not sure at this stage if the change in personality is as a result of his loyalty increasing or his ambition decreasing, (or both). It's clear to see that he has had a significant impact on the senior squad despite his young age. 2020 intake as of Mar 2022. There has been a significant increase in Pa values from this intake. (20b) Álvaro (Bal) started off as a 4.0 PA player but is now classed as 5.0 PA. At the same time, both (20e) Gorka (Bal) and (20f) López (F.Sport) have seen their PA rise from 3.5 to 4.5. The biggest change however was lower down and saw (20j) Sarabia (F.Amb) rise from a PA of 3.0 to 4.5. A rise in PA of 1.5 stars is significant. (20a) Rubén (F.Det) (2020) *. He's being re-trained as a TM(s) because that's where his future lies, but he is a little short of being able to play naturally in that role. 2021 intake as of Jun 2022. (21b) Zubizarreta (F.Det) has gone from 3.5 PA to 5,0 PA. Awesome save thus far - your latest Intake looks pretty good, and you've had a good run of form. If you can get promoted, your finances are going to receive a big relief. 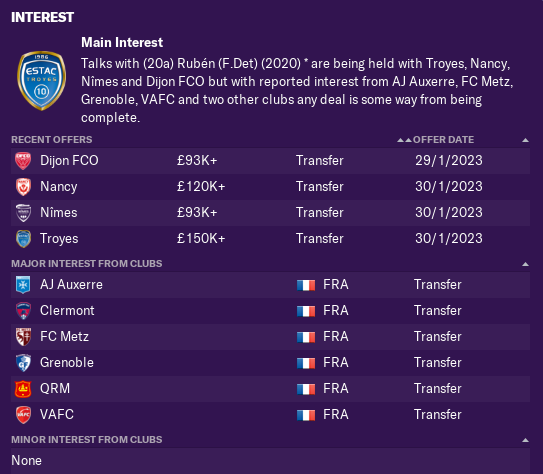 Thanks, but I'm not sure that the league above, (French National - Tier 3), is going to have the financial impact that I need it to. I also suspect that if we do go up, we will come back down straight away. I'm trying to use anything I can to track the relative ability, or more accurately, relative potential ability of the best player to come through each intake. Why we can use the PA stars, the wording introducing the Youth Intake message, "promising" labels and player attributes, we can also use value. I am going to compare the wage of each "Kriss" on the day that they sign their Youth Contract. While the wage will go up as our reputation grows and he rise up the leagues, (hopefully), it is at least another tool at our disposal. (19a) Núñez (F.Amb) (2019) * was valued at £450 when he signed his youth contract, but (19b) Aguado (Unamb) * was valued at £2,400 when he signed his youth contract. (20a) Rubén (F.Det) (2020) * was valued at £1,900 when he signed his youth contract. (21a) González (Cas) (2021) was valued at £?,??? when he signed his youth contract. (22a) Fabio (Unamb) (2022) * was valued at £2,000 when he signed his youth contract. Feb, Mar & Apr 2022. (Sorry, forgot to post each month individually). February was a breeze, March was fine and we ran Saint Etienne Reserves close, but just when promotion was within touching distance we somehow conspired to lose to bottom of the table Limoges FC. 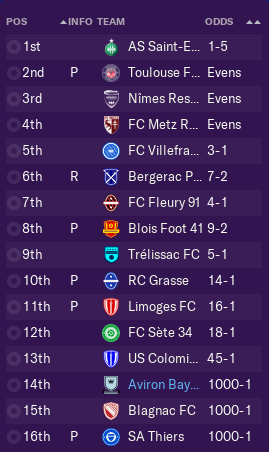 At the same time, our promotion rivals FC Fleury 91 made it 5 wins on the bounce and in fact they have won 8 of the last 9, (losing only to Saint Etienne). What an absolute shambles of a finish to the season. 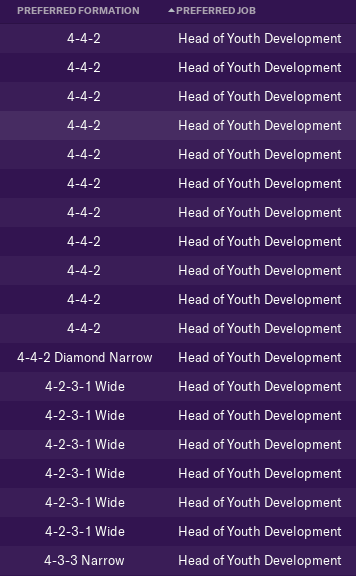 My teams always seem to struggle after the Youth Intake as if the game somehow knows that my focus has been elsewhere and seeks to take advantage. I've got the hump that we imploded in such spectacular fashion late in the season, but the reality is that with FC Fleury 91 losing only 1 and drawing 2 of the last 12 games, they are well worthy of promotion and we are still a fair bit short. End of Season 4. May 2022. Most MOM awards. It's great to have a player receive so many MOM awards, but I would much prefer that it was an attacking player. Most clean sheets. The league record was 13, but Lesec (FRA) (Bal) could only equal rather than beat the existing record. Philosophies. The new board have cancelled the existing "develop youth players" philosophy but I am hoping to reinstate it. New contract. Another new contract, but once again, only for 1 season. I've found things quite hard at the start of this save with the overall strategy of the save. Not tactics within the game. but the overall strategy of the direction of the save. Facilities - I have been desperate to improve both the Junior Coaching and the Youth Recruitment at the club. Because we have been overdrawn though. I haven't managed a single upgrade in either, despite the fact that we are now 4 seasons into the save. The primary reason for this is Finances. We have been overdrawn for the first 3.5 years and then we have had a small positive balance for the last 6 months or so. I have asked multiple times for the board to upgrade either, but on each occasion the answer has been no. 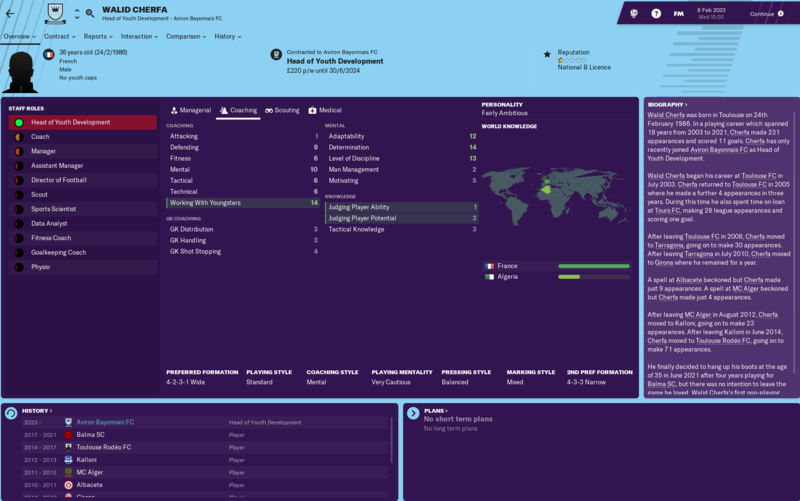 I have tried feigning interest in other clubs who have offered me interviews, in the hope that I would be able to blackmail my board when they offered me a new contract, but it just didn't work. I have tried just after promotion and when we have been in credit but still no luck. Finances - We now have 2 loans outstanding totaling £2M, but as long as we are within our wage budget I feel I have kept up my side of the bargain. I can't do any more than that until our income increases after promotion. What I have done though is limit the players that I have been offering part-time contracts to. Everyone gets a Youth contract when they come through the intake, but the only players with >3.5 PA stars get a part-time contract, (and even then only if I think they are likely to impact the senior squad as we are strong in some areas and don't use some positions at all. Other players are being signed to non-contract terms. 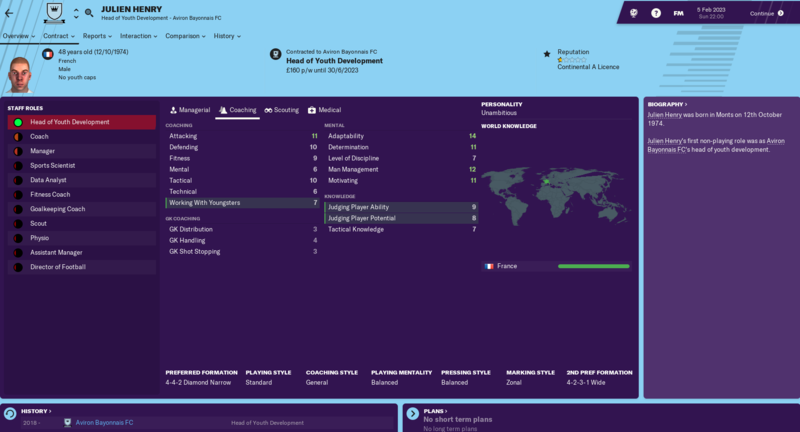 Initially this was being done as early as possible, but I have now adapted this and am only offering non-contract deals after the youth contracts expire when the players turn 20. What I will be doing here is using this as a tool to improve squad (Det) and to a lesser degree (Pro). Players who are rubbish but with hid (Det) levels are likely to be kept on, where as average players with poor (Det) are likely to be released. Signings - My plan initially was to sign Spanish Basques from Spanish clubs, (with the odd French Basque), but because of our lowly rep, the Spaniards won't join us and the few decent French Basques I have found have wanted ridiculous wages. Our local rivals Anglet have produced some decent players, but possibly as a result of the rivalry between the 2 clubs, I have struggled to poach them. This will be quite a hard and frustrating part of the save because not only can we not sign any decent players because of our low rep, but our facilities are so poor that the youngsters we are producing are not exactly great. Reputation - The other way to attract players if the club rep isn't good enough is to increase my own rep by doing my badges. I started with absolutely no badges and Sunday League rep, so our rep starts pretty low. As yet I hadn't managed to persuade them to send me on a coaching course, but they have just agreed. 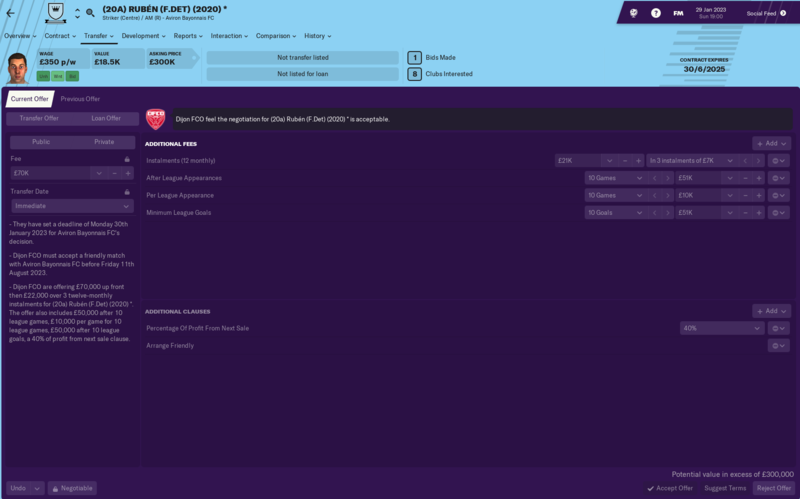 Expectations - This save is very much a marathon rather than a sprint so whenever I am given pre-season expectation options I always select the lowest option. I don't care about the wage/transfer budget and am happy to work with small figures. What I can;t afford to do is fall foul of the board expectations. Popularity - I seem to be doing ok. I'm onto the 2nd board at Bayonne and things seems to be moving in the right direction. The players like me and the fans seem to be warming to me too now. I'm now on the favored personnel list with 4 of my players, (2 of whom are products of the Academy here). Deschamps and the 4 Icons are no longer at the club. Squad personality - It's a bit of a strange one in that I'm not really sure what is going on with Mentoring, (where I was previously really keen on tutoring). I really need to pull my finger out and work out how it works, but in the short-term we seem to have decent hidden attributes. Knocking on the door Jimbo. The first years are always the toughest in this type of save - you just need that one youth star to come through and he will hopefully push you up. Yeah. Cheers Nobby. We're doing quite well, (probably over-achieving a little if I'm honest), but were going to have to be pretty good to get out of this league. I'm not sure that this coming season will be successful, but I would hope to have a right good go at it the following season. I don't think that a "star" coming through the Academy is very likely at this stage. Average Junior Coaching and Fairly basic Youth Recruitment is not usually conducive to producing quality of any sort. 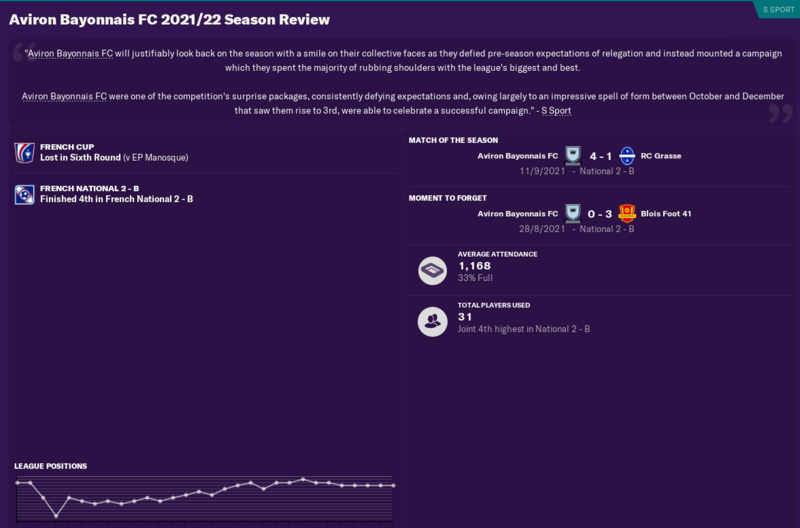 Pre-season was, well, pre-season and while losing to Reserve Teams is sort of par for the course in terms of where we are right now, I was particularly unhappy with the loss to Metz Reserves and more than that I was unhappy with the goals we conceded. 2 were penalties and we gave away a lot of free-kicks both last season and in the early stages of this season so I removed the "get stuck in" instruction before the RCO Agde game. We've got better defensively, but we are not firing at all at the other end. Small steps though I suppose. Yes, we lost in the Cup, but our goal is not to win the Cup at the moment. Our goal is yo get promoted out of this league. To that end, things are going ok. We are now just 1 point behind St-P St-H FC who are the only non-Reserve side ahead of us despite the fact we are in 6th place. Losing to Nimes Reserves was more than a bit galling because we scored what I thought was a 95th minute equalizer only to concede and lose in the 97th minute. We gained a valuable point against Saint Etienne Reserves, but a hat-trick from Roman (BAS) (Bal) HG * in a terrific display earned us all 3 points against Metz Reserves. I know that @BoxToBoxhas had experiences of Roman (BAS) (Bal) HG * that showed him as an unreliable starting striker, but he has been good for me. He has scored 55 goals for me in 124(1) appearances. That's not Earth-shattering at all I know, but in a team/squad as poor as this, it's decent at this stage of the save, especially after the early promotion, (and he holds the record of 55 league goals for the club). The win against Metz Reserves and the point against Saint Etienne Reserves has given us a 2 point advantage over Bergerac Perigord, (although we also have a game in hand), and a 3 point advantage over St-P St-H.
10 goals in 2 games was a great start to the month, but I opted to play a rotated squad against Toulouse Reserves and the result was an inevitable defeat. 1st player sale. Jan 2033. The board have just accepted an offer for (20a) Rubén (F.Det) (2020) *. He's my favourite young striker and I will be gutted to lose him, but I have decided against protesting the transfer. (In fact, I have just had a re-think and I am going to protest the transfer). 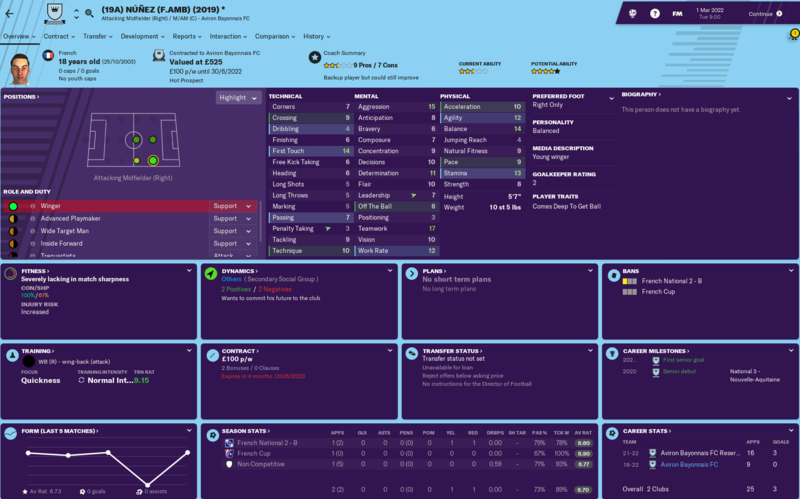 He will be worth more after promotion and I think that we will either go up this season or next season. The deal itself is a pretty good one for this level. £51,000 after 10 league games. £100,000 (£10,000 per league appearance for 10 games). £51,000 after 10 league goals. 40% of profit from next sale. The player hasn't been pulling up trees in terms of goal-scoring or even all-round performances, but I just like him. I also have to remember that I just can't go out and sign a replacement easily at this stage and it's this that has influenced me to protest the transfer. The board turned down my protest but I have sort of mixed feelings anyway. It will be good to sell a player and with any luck he will be a success and make us even more money. It's started a bit of a bidding frenzy though. He opted for Nancy in the end. Yeah it is. I'm hoping that the above player sale doesn't throw a spanner in the works. I don't think it will because he's not that influential either on or off the pitch, but you never know. We haven't really got a like for like replacement either so I will have to have a look at some new striking relationships. It looks like a decent month, but actually the draw against Pau was a very poor result that we only managed thanks to another goal by our GK. 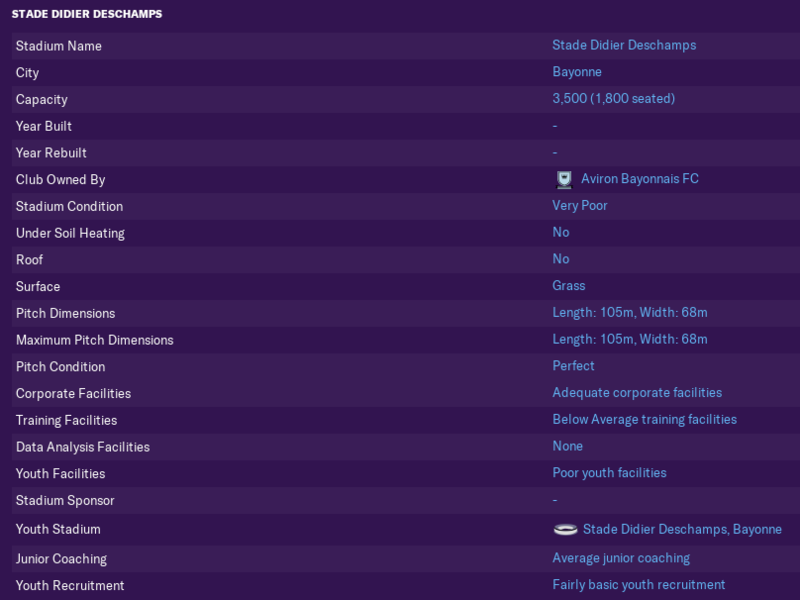 I tried to get the board to spend some of the transfer income on an improvement in either Junior Coaching or Youth Recruitment, but they turned me down on both counts. Despite the poor result at home to Pau, we are now 4 points ahead of St-P St-H. Termination of contract. Feb 2023. I think it's time to get a new HoYD. This one has done ok, but his preferred formation doesn't favour WB's so I don't think he's a a good fit for us despite the quality of players in terms of PA that he has produced. Well this hasn't gone to plan. These are the preferred formations for the available HoYD's. Not a 3/5 at the back to be seen anywhere. In the circumstances, I think what I will do is leave it for the HoYD to find a replacement. We dropped 2 points at home to Bergerac Perigord, but we have still managed to extend our lead over St-P St-H to 5 points now. 3 of our last 4 games are against Reserve Teams, so it's going to be a tough run-in even with a lead. Youth Day 5. Mar 2023. It's a "Golden Generation" at 1st attempt from my new HoYD. It's actually a pretty goof intake even though there are currently no 5.0 PA players involved. The HoYD has singled out (23d) Alastuey (Unamb) as the "diamond" within the group. He's top-rated by CA, if not by PA. 10 players at 3.0 PA and above is a good return based on recent intakes. We have 2 Martinez kids and 2 Garcia's in this intake, but neither pair are related frustratingly. "Kriss" (23a) Aizpurua (Bal) (2023). (23a) Aizpurua (Bal) (2023) was valued at £575 when he signed hi youth contract. I think we've blown it. Mar 2023. The draw against St-P St-H is a reasonable result away from home against our closest rivals I suppose, but the loss at home to Trelissac is an absolute disaster. We are now only 1 point clear of Villefranche and have no games in hand with an awful run in. I think we've blown it. So close. Apr & May 2023. 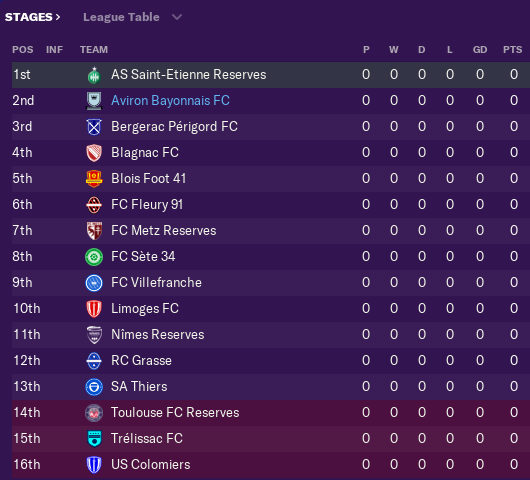 Losing against Saint Etienne Reserves is really not a big deal and drawing against Nimes Reserves is probably a decent result as they are above us in the League, but drawing at home to Blois Foot 41 is an absolute disaster. Our last game is away against Nancy Reserves who are in 7th place. We are level on points with FC Villefranche and they are away to already relegated US Colomiers. Basically, we need to gain as many points as FC Villefranche in the last game to gain promotion. We drew away to Nancy Reserves when I was really hoping for a win, but lucky for us, FC Villenfranche somehow lost to already relegated US Colomiers. We have been so lucky here because FC Villenfranche absolutely fell apart in the run-in, losing 3 of their last 4 games, (and we still only beat them by 1 point). End of Season Summary. May 2023. Stadium not being expanded. May 2023.